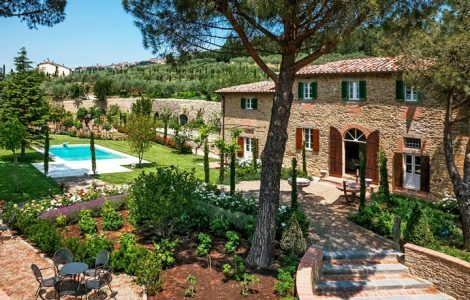 If this refurbished villa/farmhouse looks familiar, that’s because it served as the life-changing home of Diane Lane in the 2003 blockbuster Under the Tuscan Sun… and undoubtedly, it will change your life, too. 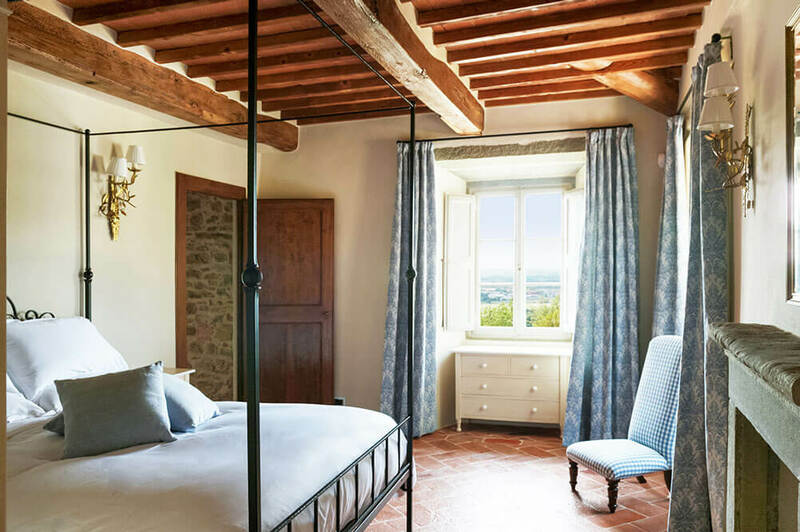 Play out your own scene from a movie with a stay in this airy hillside Cortona estate that’s flooded in natural light and decorated in a creamy palette of whites, blues and greys. 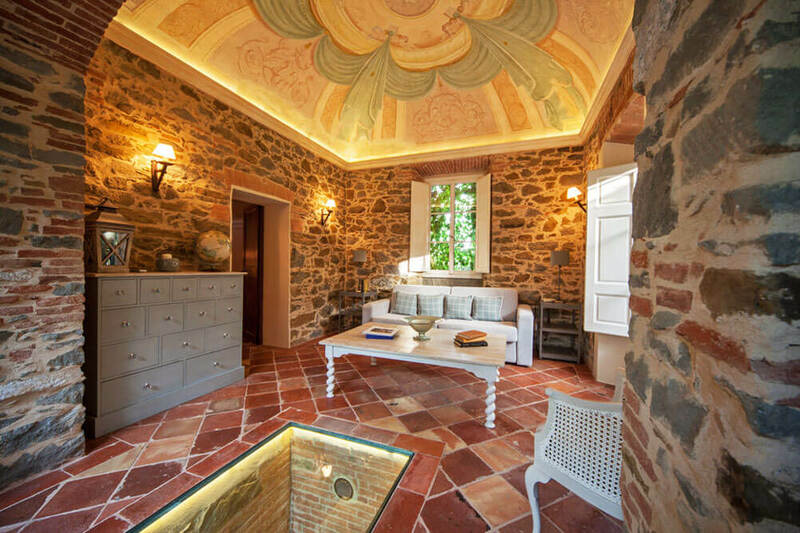 Accents of the original structure come through in the form of brick archways and the original 17thC fresco ceiling in the Limonaia (lemonary). Plunge into the private pool or lounge on a hammock propped between fruit trees as you soak up the sights of scents of the villa’s fragrant gardens and looming peaks in the distance. For added fun, there are pool and ping pong tables, a bocce court and an outdoor hot tub. You can comfortably accommodate up to 20 people in this 10-bedroom/ensuite bathroom property. With expansive grounds, stunning gardens and modern amenities, your stay in Villa Laura can be as relaxing or active as you like. It’s a marvelous refuge for large families, groups of friends, and wine-lovers. This was the best holiday we have ever experienced. Our guides were outstanding in their care, humor, communication, and attention to details. In addition to the villa’s lovely grounds, it also boasts a wine cellar stocked with many of the local varietals. The outdoor ping pong table and bocce court make it a hit with the rest of the family, too! With ten bedrooms split between the property’s elegant villa and its rustic farmhouse, Villa Laura can serve as the backdrop for an intimate gathering of friends and family. It has a capacity for up to 20 guests. The main villa has five bedrooms available, each featuring either a king or queen size mattress and an en-suite bathroom including both a shower and tub. All of the rooms have beautiful views, either looking out over the garden toward Cortona or over the valley. 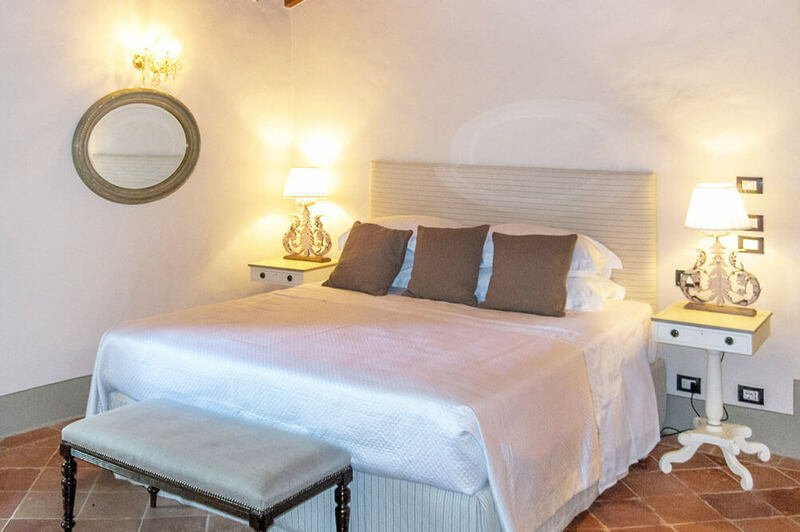 Each room is uniquely designed featuring antique furniture, hand-woven Busatti fabrics, beautiful travertine stone in the bathrooms and high-quality bed linen. The Farmhouse has four bedrooms available, one king size, two queen size and one with two single beds that can be made into a double. Each room has its own en-suite bathroom, two with a bath and a shower and two with just a shower. All rooms all feature beautiful views over the garden. The Limonaia is a double suite with an en-suite shower room, living area with double sofa bed and a private terrace with beautiful views out over the valley. The room has been carefully designed using colours from the original 17thC fresco which covers the dome ceiling of the living room. Soft pinks, turquoise, and creams create a relaxing atmosphere—and with its own private terrace, you have complete privacy from the rest of the garden. Discover a few ways to weave Villa Laura into an even grander journey.